On our way from the railway station in Lakatnik to our cottage on the feet of the Balkan mountains we always pass two premisses that stand side on side to each other, but are seperated by a barbwired fence. To the family on the left side, Iwan and Koprinka and their daughters we are frequently invited. Iwan worked most of his life in a nearby Uranium mine, and now suffers from Parkinson disease. The most exciting event in his life was in 1968, when he was recruited to the Bulgarian Peoples Army to help defend the socialist case in Prague against the democratic freedom movement. Koprinka, his wife, is always makes jokes on him each time Ivan invents a new story about his braveness. She had a good education, but rarely found a way out of the hardships of the village life. Now all the duties lay on her, the work with the garden, the big house, farmland around, and supporting her two daughters. Only when she goes to pastures the goat in the hills, she finds some quiet moments. She usually takes with her a paperback book or a newspaper and dreams away, while her animals pick to most aromatic herbs. The house to the right looks almost like a mirror image of Iwan and Koprinkas place, except that the garden is a bit more planned and kept clean, and the attached garage and shed for the equipment looks simply more civilized. This house belongs to Iwans brother Kyrill (“Kirtscho”) and his family. 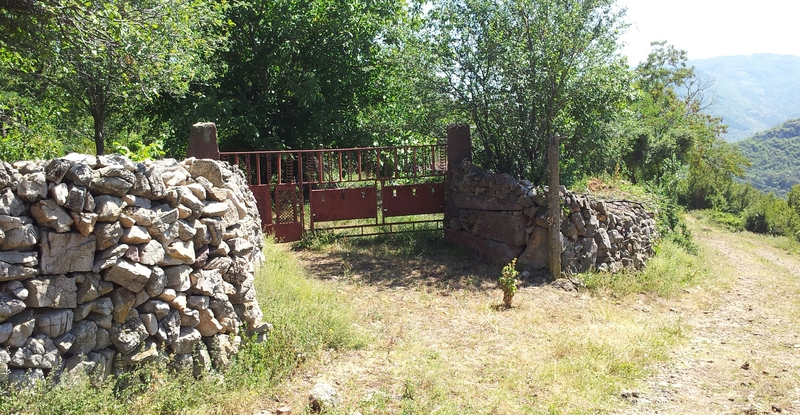 The sad thing is that the two families are bound by a long lasting hostiliy, the neighbors say that the brothers had a legal issue on the land that they inherited from their parents. Property in Bulgaria is traditionally the most important asset of everyone, be it farmland, houses in the countryside, a weekend cottage or an apartment in the city. I have rarely met people somewhere else who are so obsessed with keeping or increasing the real estate property as in Bulgaria. It is quite common that children get their first apartment as a gift when they pass the higher education. And when a boy marries a girl, their biggest concern is not so much the dress or the party or the wedding cake. The biggest issue is how to merge the properties of the two in the best and most profitable manner. One can easily imagine how complicate things become after a divorce or when property is inherited to several children. Something in the regard must have caused a big dispute between the two brothers, an issue so dramatic and irresolvable that neither of their two families talks to the others. At least this is how it looked untill recently. But now the generation of Iwan and Kirtscho’s grandchildren already grow up. There is Ivailo, the 8 year old son of Iwans daughter Monika, and on the other side of the fence is Nevena, the granddaughter of Kirtscho. These two cousins seem to be pretty resistant to the hostiliy between the parents and grandparents of both family branches. Instead, because on this spot of the village there are not many other kids to play with, so the two seem to use every moment to meet at the two sides of the fence. They don’t look up, so they can’t see the awful barbwire (“botliva tela”), but they only have eyes and ears for each other. They can sit their for hours and entertain each other. They have not heared about the issue of real estate property, and perhaps they think that the high fences between their places are only there to keep away Koprinkas goats from the neighbours cabage plantation, and protect Koprinkas chicken from the neighbors young dogs.